Body size is relatively large compared to others of the Abyssinian subgroup; horns are mainly large, usually curved inwards either manually or through training; hump is prominent and well-developed; coat colour is highly variable (Rege and Tawah, 1999). Maintained by the Musri and neighbouring pastoral tribes of South Omo Zone of southern Ethiopia. 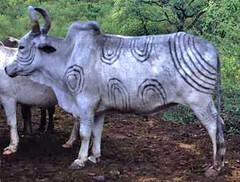 The Small East African Zebu are believed to have descended from the recent introductions of zebu into Africa from Asia, and some may have ancestral linkages with cattle of the Large East African Zebu group. The breeds or strains that belong to the Abyssinian Shorthorned Zebu group have tribal and ecological origins, which do not necessarily imply genetic differences. Most of the small Abyssinian Shorthorned Zebu inhabit the higher altitude wetter agricultural areas, and hence they are also referred to as Ethiopian Highland Zebu. The Mursi cattle are kept by the Mursi and neighbouring pastoral tribes of south-western rangelands of Ethiopia close to the Kenyan border.